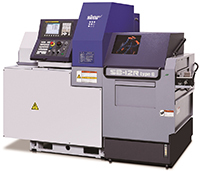 STAR MICRONICS has developed SB-12R type G as a new model of the Swiss type automatic lathe (Note 1) mainly targeted to the automobile, information & communication equipment and medical industries. The model being scheduled for release in April, 2015. Since the release of the SB-16 in 2003, the SB series has been a bestseller with sales totaling more than 7,000. The new SB-12R type G employs a guide bush/non-guide bush switching function (Note 2) like the SB-16R/20R type G released in June, 2014, and designed for machining of small-diameter workpieces (with max. machining diameter of ø13mm). The 7 controlled spindles include the main spindles (Z1, C1), gang-type tool posts (X1, Y1) and sub spindles (Z2, X2, C2). The guide bush type functions to work as a steady rest for maintaining long workpieces such as motor shafts in order to suppress workpiece deflection and achieve accurate machining. For short workpieces such as nuts, the non-guide bush type is effective to reduce the length of remaining materials to be discarded, thus reducing the cost of materials. With these two types, the optimal machining can be selected according to parts to machine. Like the conventional SB series, the gang-type tool post accommodates the STAR original slant-slide guideway structure (Note 3) to allow continuous machining with stable accuracy thanks to high rigidity inherent to the machine. The main spindle achieves a maximum rotation speed of 15,000 rpm. Both the main and sub spindles are equipped with C-axis control function as standard. The tool post specifically designed for back working equipped with a tool rotation drive unit to enhance complex machining performance on the rear end. The NC unit has a variety of help functions, such as an alarm help function for monitoring alarm contents on the NC screen. A swing type operation panel also ensures the optimum working position and contributes to the improved operability and workability. The guide bush type/non-guide bush type can be switched over according to the workpiece overall length. The gang-type tool post can accommodate four kinds of power tools such as 4-spindle cross drill unit, 5-spindle cross drill unit and cartridge type 5-spindle/5-spindle high-speed type for selecting optimum efficiency. Mounting the cartridge type 5-spindle/5-spindle high speed type enables the combination of large variety of tool units at three cartridge positions. The 4-spindle unit designed for rear-end working can be equipped with a tool rotation drive unit to improve eccentric drilling, slitting and other complex machining on the rear end. The main spindle employs a built-in motor for enhanced indexing accuracy.